Dr. Sharma lives, and practises medicine in Delhi. He is a keen seeker of truth and an avid reader of our Back to Godhead magazine; and he often inquires from me on a variety of topics. The good doctor found the svāmī’s answer to his question completely unsatisfying. He countered by saying that if all of a person’s activities are to be considered a pastime of the Lord, then why is it said that man must experience the results of his own pious and sinful activities? When the svāmī attempted to justify his explanation simply by repeating the same phrase, “It is all a pastime of the Lord,” Dr. Sharma exclaimed, in the midst of that assembly, “I am not satisfied with your answer.” The common people in the audience were simply listening to their arguments. No one could understand the essence of the topic, nor did anyone even try to understand it. The truth, though, is quite different from what this question implies. Among all the meaningless obstacles monists have created in this world by conceiving of God and the living entity as existing in total oneness, none is more severe than the introduction of this particular type of doubt. 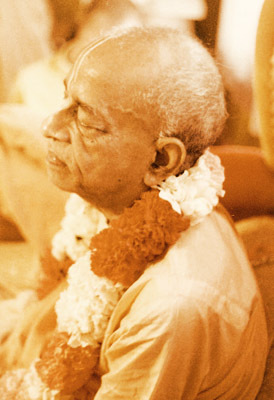 Therefore, it is not possible to support the doctrine of impersonalism, a doctrine which completely destroys one’s spiritual life, without concocting the alleged ‘divine’ theologies that are conveyed by statements such as “Nārāyaṇa has become impoverished to enact the pastime of begging;” “Nārāyaṇa has become a pig to enact the pastime of feeding on stool;” “The supreme spirit in the form of deliciously prepared chicken eggs is reposed within the belly of that same supreme spirit in the form of a holy mendicant” and the like. It is for this reason that Śrīmān Mahāprabhu clearly stated, “māyāvādi-bhāṣya śunile haya sarva-nāśa – hearing the commentary of a Māyāvādī completely destroys one’s spiritual life.” As long as this form of artificial spiritualism, known as impersonalism, is not expelled from this world, the common man shall not be able to comprehend Śrī Kṛṣṇa’s identity, nor His name, qualities and so forth. Foolish people readily accept such malformed theologies simply because they are sold out to their sect, but they are unable to comprehend the real implication of their conception. What else could be the fate of a common man who keeps the harmful association (asat-saṅga) of the impersonalists but to be misled and converted to atheism, only to engage in mere sense-gratification? * To read the complete article, obtain a copy of Rays of The Harmonist, Kārtika 2009 Edition. Rays of The Harmonist On-line, Year-2, Special On-line Edition “Is Human Misery a Pastime of God?” by Śrī Śrīmad Bhaktivedānta Svāmī Mahārāja, is licensed under a Creative Commons Attribution-Share Alike 3.0 Unported License to ensure that it is always freely available. You may redistribute this article if you include this license and attribute it to Rays of The Harmonist. Please ask for permission before using the Rays of The Harmonist banner-logo.